Pennsylvanian sedimentary strata are faulted and fractured along the Sangre de Cristo Fault (field notebook for scale). All seven of the gravity lines display anomalies that can be attributed to local geologic features. All of the exposed faults that were mapped by Bauer and Kelson correspond to anomalies in the gravity curves. This close correspondence between the mapped faults and the gravity data demonstrates the utility of the gravity method in this geologic setting. For the purposes of this preliminary analysis, we will therefore assume that similar anomalies in the corrected gravity curves are due to buried faults. The five gravity lines (G1, G3, G4, G5, G6) that cross the major rift-bounding fault (Sangre de Cristo fault), which separates the mountain bedrock from the basin sediments on the geologic map, show major gravity anomalies of the classic shape for normal faults (see gravity cartoon). Although the data are not yet geologically modeled, the magnitude of the gravity anomaly may suggest that fault displacement is larger than predicted. Modeling will be done by geophysicists at UTEP, and will be posted on this website when it becomes available. In all cases, the large magnitude anomaly of the Sangre de Cristo fault is centered basinward of the mapped fault boundary between Quaternary gravels and Pennsylvanian bedrock. This suggests that the Sangre de Cristo fault zone is wider than its surface exposure, with additional unrecognized faults along the mountain front. All seven of the corrected gravity plots slope relatively steeply into the basin. Such a pattern suggests that the buried bedrock is deepening into the basin. All seven of the lines also show smaller anomalies superimposed on the westward sloping curve. We interpret these anomalies as buried normal faults that generally step down into the basin. Five out of six lines that cross the basalt line (basalt line = line projected onto land surface that corresponds to the eastern edge of the buried Servilleta basalt flows) display small anomalies that are interpreted as normal (west-down) faults. The presence of basalt to the west cannot explain the anomalies, because basalt is more dense than the sediments, and therefore buried basalt will have a tendency to cause positive gravity anomalies. It is likely that the faults detected by the gravity method actually formed topographic highs that stopped the eastward flow of basalt in Pliocene time. Near Hwy-68 is a small anomaly that corresponds with the approximate eastern edge of the buried Servilleta basalt flows. Both lines also show small anomalies that may be small buried faults. The Town Yard water well is situated just north of the gravity line. Pennsylvanian bedrock was encountered at approximately 700 ft in the well. This point indicates that the basin is shallow at least 3 km from the mountain front. In this line, the gravity expression of the Sangre de Cristo fault lies further basinward than geologic mapping showed. The line also delineated a smaller anomaly approximately 1 km from the mountain front, and two other potential faults near the western end of the line. These lines revealed an extremely wide anomaly along the Sangre de Cristo fault, which probably indicates a complex zone of sub-parallel faults. It also displays three smaller anomalies under the City of Taos, which may be faults that break up the structural bench under the city (see cross section). One anomaly, located under Taos Plaza, corresponds with the basalt line. The eastern end of this line has probably defined a buried fault strand that links mapped faults to the north and south. The buried link is farther basinward than the field mappers postulated. Two smaller anomalies exist near Hwy-68, one of which corresponds to the basalt line. Also, this line may indicate that the Town Yard fault lies farther westward than shown on the geologic cross section. This northernmost line was designed to examine basin structures, and did not extend eastward into the Sangre de Cristo fault zone. However, the line contains evidence for at least three faults buried under Taos. These faults may be part of the Town Yard fault zone. 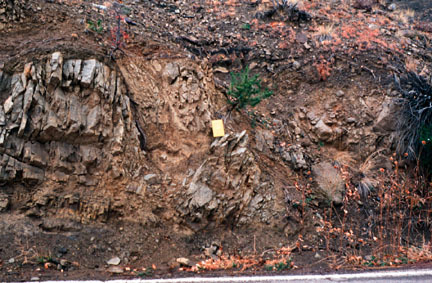 One of the faults corresponds with the basalt line. Fidelity of the exploration simulation depended upon the application of space-proven instruments to solve a real scientific problem. Not only did data from the gravity surveys yield important information on the location, magnitude, and dip of the Sangre de Cristo fault, but they also delineated faults that were suspected on the basis of surface mapping, but are buried. In other parts of the Rio Grande Rift, such faults profoundly affect the movement of ground water. This new information on fault geometry will be incorporated into geology models, which can then be used to generate hydrogeologic models. The hydrogeologic models are used to quantify water availability, which is information used by planners and policy makers to address the critical water needs of New Mexico's growing population. The astronaut surveys provided real data for addressing a pressing societal problem. In the near future, the data will be published, with acknowledgment of the astronauts' contributions, in a scientific report by the Bureau, as well as in their science news publication. The Bureau of Geology is providing materials to the astronauts for use in presentations to schools and to the public at large. Newspaper science writers in the region observed and reported on the exercise, and these articles are attached. Articles will also be written for NASA internal news publications, for a popular science magazine, and for geological/geophysical research news publications.